Angela Orosz weighed just a third of what a normal infant does when she was born in Auschwitz, and only escaped death at the Nazi concentration camp because she was so weak she was "unable to cry". The 71-year-old will appear in a German court this month to give her harrowing testimony against Reinhold Hanning, a former guard at Auschwitz, who she says was part of the "killing machine" that destroyed 1.1 million lives in the camp. "Because so much time has passed since then, it's important that the last remaining survivors speak out," Orosz told AFP from Montreal, Canada, where she now lives. "I'm probably the youngest of them, but for me it's a duty to keep the memory alive." Orosz's birth in Auschwitz was nothing short of a miracle, given the abuse that her mother suffered in the camp in occupied Poland. To her knowledge, she was one of two babies born in Auschwitz who survived. Her parents had wedded in 1943 but the Nazis invaded Hungary a year later, and forced them onto a train car for cattle. 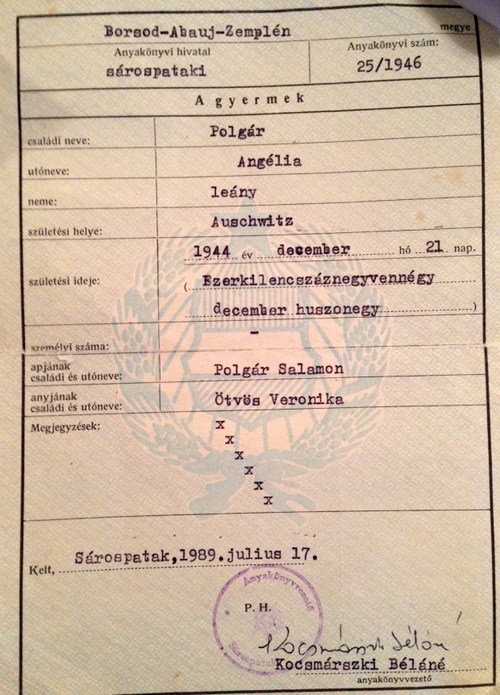 Her mother was already pregnant when they arrived in Auschwitz in May 1944 and were both put to hard labor.Her father died of exhaustion, while her mother was so undernourished that the pregnancy did not show even in the seventh month. She was also subjected to notorious camp doctor Josef Mengele's gruesome experiments, including a sterilisation procedure that entailed inserting a burning substance into her cervix. All the while during the torture, Orosz was in her uterus. Although she was only an infant during the one month she spent in Auschwitz before it was liberated on January 27, 1945, Orosz said it was clear that "it has marked my entire life". "I was a very sick baby. I looked like a rag doll. In November 1945, when I was almost a year old, I weighed only three kilograms (6.6 pounds)" -- the weight of a newborn. Her mother also survived. "My mother was the only one convinced that I would live," she said. A doctor cared for her for several years until her bones were strong enough to walk on. "The legacy of Auschwitz, of my mother's starvation and abuse, never disappeared completely. I stand less than five feet (1.52 metres) tall today," she said. Orosz only returned to Auschwitz for the first time last year, convinced by her stepbrother. "I was hesitating, because my mother had always said to me, if you don't have any memories, don't get any. But I thought about it for a long time, and in the end I (summoned) the courage," she said, adding that one of her two grown children accompanied her. "It was tough to be there. At the same time, I and many other survivors wanted to show the world that we survived, that Hitler did not win, that the Jewish people are strong and will be strong." At Auschwitz she was approached by a German lawyer who asked her to testify at the trial of Oskar Groening -- known as the "Bookkeeper of Auschwitz". "I first told him no. Then, I heard the testimony of one of the survivors, who embraced Herr Groening in the courtroom and publicly forgave him, and my blood was boiling. We survivors cannot forgive in the name of the six million who were murdered. Then I decided I was going to testify after all." At last April's trial of Gröning, who was sentenced to four years in jail as an accessory to murder in 300,000 cases, she told the accused to his face: "I cannot forgive you." She dismissed any talk that low-ranking SS officers were simply following orders, calling that "a lie". "They knew that children, men and women were murdered when arriving in Auschwitz. They smelled the... burning human flesh coming from the crematoria. If they were there, they were part of this mass murder." That many of the defendants are now well in their 90s is not an issue, Orosz said. "The crimes that were committed at Auschwitz are so unspeakable that we can't just stop and say it's too late now," she said. She said the terror wrought by the Nazis needed to be kept alive in human memory. "It seems the world is very forgetful, and when I hear that anti-Semitism and extremism is rising again in Europe, I become angry. But at the same time I become convinced that these trials must be held."